This photo from the inaugural Rhode Island Aviation Hall of Fame induction in 2003 shows RIAHOF President Frank Lennon, flanked by former RI Governor Bruce Sundlun (L) and former American Airlines Chairman Bob Crandall—both members of the Advisory Board. Rhode Island Aviation Hall of Fame, Inc. (“RIAHOF”) was incorporated as a Rhode Island non-profit corporation in April, 2000. In December, 2003, Rhode Island’s salute to the Centennial of Flight included the induction of the first seven members into the newly-launched Rhode Island Aviation Hall of Fame. That centennial event, as well as the Hall of Fame, was organized by the USS Saratoga Museum Foundation, Inc. The concept is supported by a number of other aviation-related groups in the state, to include groups such as the Rhode Island Air National Guard, Quonset Air Museum, Rhode Island Pilots Association, the Civil Air Patrol, the Quiet Birdmen, the Rhode Island Aviation and Space Education Council, and the EAA. Honorees are selected by an ad hoc committee representing a number of aviation groups. 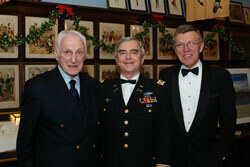 The committee includes previous inductees such as Robert Crandall, former chairman of American Airlines; World War II bomber pilot and former Governor of Rhode Island, Bruce Sundlun; retired Army Colonel and astronaut Woody Spring; and Jennifer Murray, first woman to fly solo around the world in a helicopter. 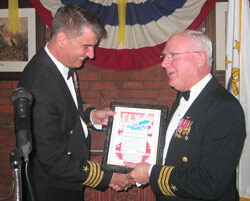 During the 2005 induction of the late Vice Admiral James Stockdale, Director Rich Suttie (l) presents plaque to CDR Porter Halyburton USN (Ret). Halyburton, a POW with Stockdale, gave the acceptance remarks on behalf of the deceased former vice presidential candidate. For a full list and short biographical sketches of all honorees, please visit www.riahof.org. Displays and information about the inductees are now housed in temporary quarters at the offices of the aircraft carrier project, at 6854 Post Road, North Kingstown, RI 02852. The permanent site of the Hall of Fame will be aboard the retired aircraft carrier John F. Kennedy, which will open as a family attraction, educational center, museum and memorial on Rhode Island’s beautiful Narragansett Bay sometime within the next few years.